F Jon Leuer, 6-10/240, Jr.
F Keaton Nankivil, 6-8/240, Jr.
G Jason Bohannon, 6-2/198, Sr.
G Trevon Hughes, 6-0/193, Sr.
G Jordan Taylor, 6-1/194, Soph. G/F Ryan Evans, 6-6/210, Fr. G/F Tim Jarmusz, 6-6/210, Jr.
G/F Rob Wilson, 6-3/200, Soph. Wisconsin profile: The Badgers are a tough team to predict what they can do because they are still adjusting to get star player Jon Leuer back in the lineup. Leuer's addition late in the year gives the Badgers 2 bigs and they have decided to go with a three guard lineup to go with 3 guards after the emergence of Jordan Taylor as maybe the Big Ten's best pure point guard. This team could go all the way to the Final Four as long as they don't all have off shooting nights at the same time like they did against Illinois in the Big Ten Tournament. 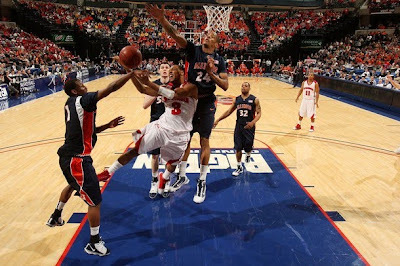 The Badgers are very efficient on offense and with Leuer they can score inside and outside. The big thing about the Badgers is they don't turn the ball over period and they don't let you run on them period. Keep in mind the Badgers have been playing during March Madness for over a decade in a row now so they also have plenty of tournament experience on the roster.